As you may be aware, French cartoonist Placid was fined €500 on January 18 for having insulted the French police with his cover (pictured) to a self-help book, Vos Papiers! Que faire face à la police? – on the, in France, ubiquitous control of identity carried out by the police – published back in 2001. The writer, a magistrate in Versailles, Clément Schouler was fined €800 for having called the practice “facially selective identity control” (ie. suggesting that the practice is racially biased), which the court found defamatory, and the publisher Michel Sitbon was fined €1.000 for his part. While having garnered considerably less attention from the press than the recently ended Charlie Hebdo trial, the present case touches upon similar issues of free press and free speech. 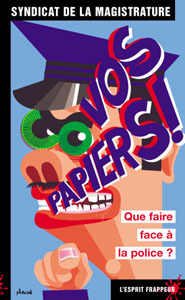 A large number of cartoonists, writers and journalists have voiced their support for the people behind Vos papiers! and a number of their efforts – cartoons, images and written pieces are now being collected in a benefit book, Tous Coupables! published by a conglomerate of smaller publishers including L’Association, Cornélius, Vertige Graphic, L’Ésprit frappeur, Les Requins marteaux, Thé-Roc, and Éditions nautilus. To me, it is shocking to see that a society so up in arms about the Muhammed cartoon crisis seems to be letting this one pass. More than likely, this is mostly because it has passed under the radar, but that in itself is unsettling and sadly indicatory of disturbingly autocratic developments – with strong xenophobic inflections – within the political establishment in France and French society as a whole. The height of hypocrisy in this case is, unsurprisingly, delivered by the thoroughly unsavoury favourite to win the coming presidential elections, Nicholas Sarkozy. Probably the most vocal of the many top politicians across the spectrum who came out in unequivocal support for Charlie Hebdo when they were being sued by a constellation of Muslim organizations, he made sure the present case – which dates back to 2001 – was reopened after it had been dismissed in 2006. Apparently he thinks that the French police, which he keeps insisting the country needs more of, is so sacrosanct that it should be placed above not only the holiest man of Islam, but one of the fundamental principles of modern Western society. Many of the contributions to the book can be seen at the blog devoted to the support of the people behind Vos papiers! Here’s Le Nouvel Observateur‘s commentary and a rundown of the case.